Albuquerque's 50-mile bicycling, running, and walking loop. Download 50 Mile Activity Loop map. The 50-Mile Activity Loop is the City of Albuquerque's 50-mile multi-use trail and bikeway path. The project benefits quality of life and health and wellness for locals with opportunities for economic development, tourism and possible events, such as a 50-mile or Century ride and charity walks. The City worked with community leaders, citizen groups and local engineering firm Wilson & Company to develop the 50-Mile Activity Loop Plan, which was completed in September of 2013. 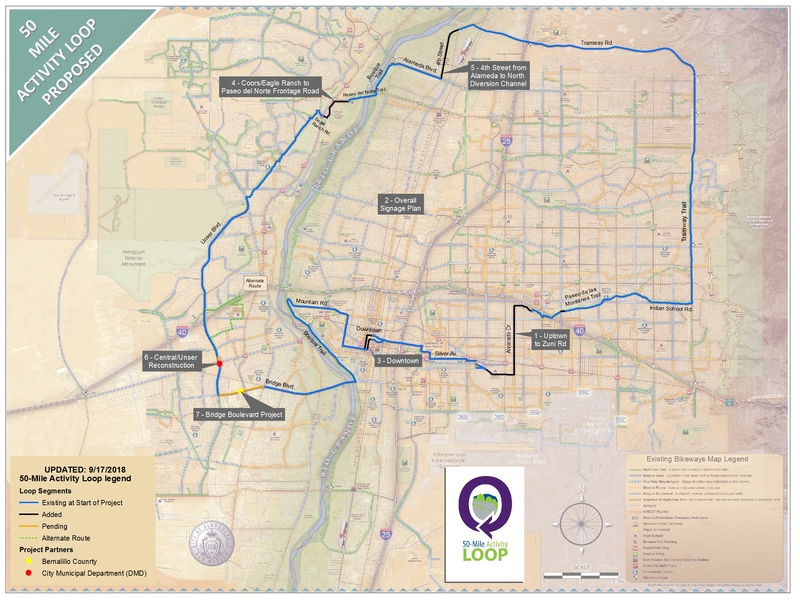 The Loop starts in Downtown Albuquerque and travels through the Old Town and museum district, crosses the Rio Grande and touches the edge of Petroglyph National Monument. It travels along the Riverside Trail up to the Paseo Del Norte Trail, and on to Balloon Fiesta Park. It takes trail-goers along the northern edge of the city and along the Sandia Mountains. On their way back to Downtown, there will be shopping and eating opportunities to enjoy, thus stimulating the economy and also creating one more reason to live, work, and play in Albuquerque. The map above shows red sections (gaps to fill) that will join with the blue sections (existing bikeways and trail facilities) to complete the Loop. The map also shows mini-loops that can provide connections to the Loop, which would be a future project. Projects have been implemented in phases. Learn more about 50-Mile Activity Loop Projects. The 50-Mile Activity Loop has been a cooperative effort between the City of Albuquerque, MRCOG, NMDOT, Bernalillo County, MRGCD and AMAFCA. Projects have been funded by City budgets with no additional taxes. The Coors/Eagle Ranch project is funded by federal dollars and a local match.